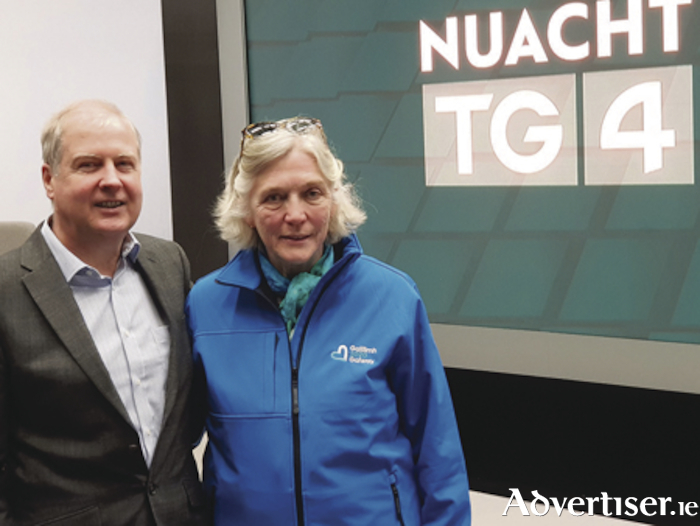 Alan Esslemont, director of services of TG4, and Hannah Kiely, chief executive of Galway 2020, at the announcement of their new partnership . The Galway 2020 programme will be covered through Irish following a new partnership with TG4. Language, which plays a central role in the programme, is one of the three major themes of the programme along with landscape and migration. The Galway 2020 programme will include projects that celebrate, encourage and shine a spotlight on the beauty and uniqueness of the Irish language. It will also pay homage to all other languages that are spoken in Galway, with a growing number of the population speaking neither English nor Irish on a daily basis. Speaking at the signing of the agreement, chief executive of Galway 2020, Hannah Kiely said the Irish language was an integral aspect of culture in the west coast of Ireland. TG4’s director general, Alan Esslemont, said TG4’s ‘Súil Eile’ (a different view ) approach aimed to provide the Irish community and the world with a broader view of life. "We have always had pride in our heritage, but we are open and welcoming to new inspiration as well. This is a creative and smart partnership between TG4 and Galway 2020 through which we can work together to shine the cultural light of the West of Ireland on the European stage and even further afield."